At BOXX, they have a simple philosophy: they believe creativity shouldn’t have to wait on hardware. For creative professionals using creative software applications like Adobe Creative Cloud, Revit, SketchUp and others, BOXX workstations are designed specifically to remove these creativity bottlenecks. Professional engineers push the boundaries of overclocking and liquid cooling to offer speeds you won’t find anywhere else, backed up by expert technical support and knowledgeable performance specialists. 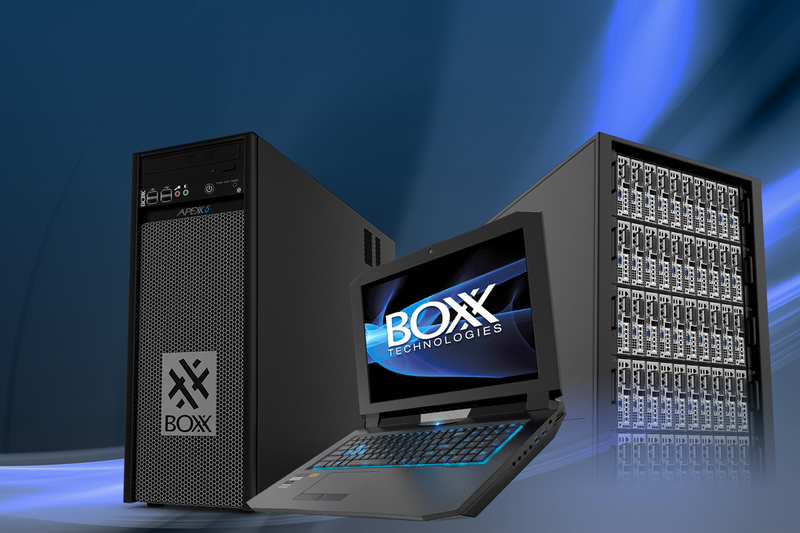 All BOXX workstations and rackmount systems are designed with workflows in mind. Whether your focus is GPU rendering, CPU rendering, computational simulation, 3D design & modeling, or neural networks & deep learning, They offer solutions that boost productivity and provide maximum return on your investments. Whatever your workflow, there’s a BOXX for you. When dealing with detailed architectural, engineering, and construction models in today’s business environment. The ability to create and edit quickly enables design professionals to gain a leg up over their competition and affords you the opportunity to do even more with your business. That’s why BOXX engineers have designed the fastest CAD and BIM systems available anywhere. Product design and manufacturing require extensive computing power to achieve stunning results that impress clients and prospects. Whether your workflow requires SOLIDWORKS, CATiA, Inventor, or even advanced computational simulation in applications like ANSYS, BOXX offers solutions that give you the competitive edge. 3ds Max, Maya, Cinema 4D, V-Ray, Octane Render, DaVinci Resolve – they’re your bread and butter for VFX and media creation. Ensuring these applications operate at peak performance is crucial to your business, and BOXX knows it. That’s why they build systems to accelerate even the most advanced entertainment workflows. From 3D modeling & design to composite rendering, BOXX is THE go-to source for media & entertainment creative pros. To deliver world-class on-air graphics and real-time broadcast solutions, broadcasters need hardware tailored to support a variety of advanced configurations, including dense multi-GPU options for rendering and overclocked CPU options for design & compositing. BOXX is proud to offer hardware solutions that provide gorgeous, seamless experiences for viewers across the globe. Virtual Reality is everywhere these days, and BOXX is leading the way. BOXX workstations can handle large, complex 3D assets and still maintain rock-solid reliablity whether you are designing in 3D for VR, or consuming immersive VR content. Boxx engineers have teamed with NVIDIA® to design custom-built systems that insure the best graphic expereiences for professional deployment, capable of beautiful, seamless 90+FPS display.